Download the complete entire Playbook without any shipping costs. Most new laptop computers are being sold now without a CD/DVD drive, so a download makes perfect sense! You have the option of annually renewing the download for $25/yr. Before purchasing, make sure that your device is compatible with zip files. But wait! Become a Premium Member for just a little more ($49) and this download is included with it for free! Comprehensive Playbook... "content is king" and nowhere else will you get so much content. 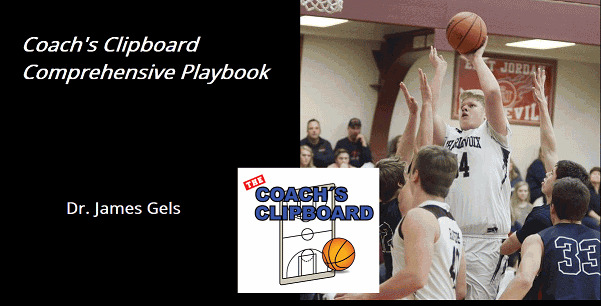 The Coach's Clipboard is the long-standing trusted Internet basketball coaching resource (since 2001) and is all about basketball information and ideas... a basketball coach's encyclopedia. Over 1000 pages of plays, offenses, defenses, drills, coaching and player tips. Complete Product Available as a Download. Animated Diagrams... many animations of plays, offenses, defenses are available to show player movement and timing. Click here for a sample. Video... many video clips of coaching tips and player fundamentals are included. See a screen-shot. See Video Contents. Compare to other Coach's Clipboard Products... Click here to compare. Problems, Questions? Usually things go well without any problems. But if, after purchase, you have any problems or need instructions, see the Playbook Instructions page, or contact us.